We joke about our YOLO Moo Igloo in our agricultural product range being perfect for “calves, sheep, goats and very big dogs” and the truth is that a YOLO Moo Igloo is an ideal kennel for large dog breeds like great danes, bullmastiffs, St Bernards, Irish wolf hounds and even golden retrievers. We can mould in a variety of colours to suit your dog’s personality and to make it an attractive feature in your garden. Colours: Green, blue, yellow, pink, orange, white. 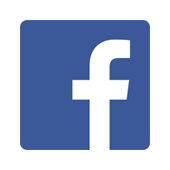 Note that the colours shown in the image are close to the real thing but not exact. Colours can differ slightly between plastic batches. Our hutches stack like yoghurt cups and can be transported 5-10 units high on the back of a bakkie and up to 15 units high on a trailer. Please contact us directly for additional information and transport options. Our factory location: Parys, Free State (about 120km south of JHB – take the R59 off the N1). 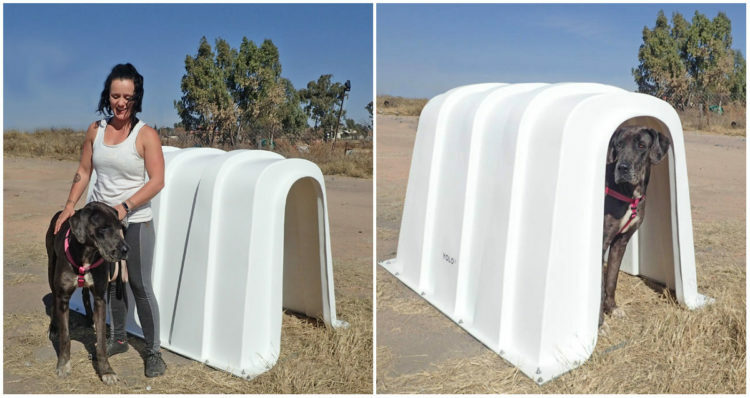 The YOLO Large Dog Kennel offers shelter from sun, wind and rain. At 1.7m long, 1.15m wide and 1.1m high, it has enough space to accommodate more than one dog of large to medium size. This robust kennel is rotomoulded as a single, strong unit from UV-stabilised polyethylene. It is built to be outdoors and to withstand the elements. Choose a colour that suits your dog’s personality and that matches your garden decor. Inspired by 1000-year old buildings in Spain, our design incorporates buttressed side walls for structural reinforcement. Plastic is non-porous, unlike wood and other materials used to make large kennels. 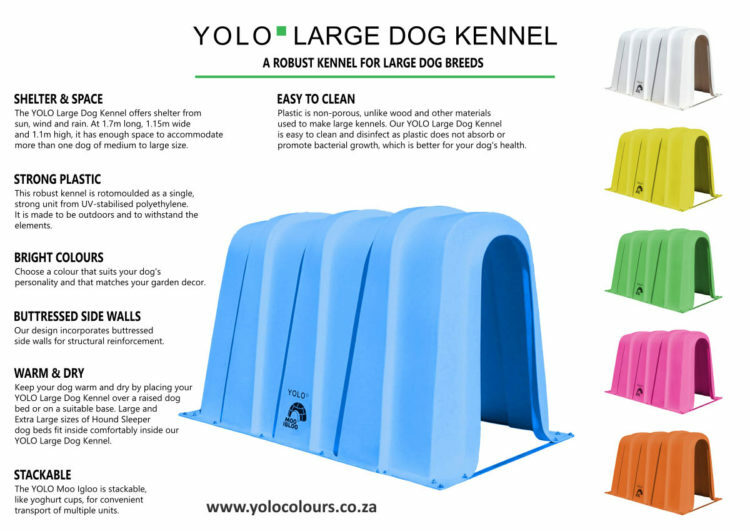 Our YOLO Large Dog Kennel is easy to clean and disinfect as plastic does not absorb or promote bacterial growth, which is better for the health of your dog. Tip it over, spray it out and leave in the sun to dry. Keep your dog warm and dry by placing your YOLO Large Dog Kennel over a raised dog bed or on a suitable base. Large and Extra Large sizes of Hound Sleeper dog beds fit inside comfortably inside our YOLO Large Dog Kennel. You do not have to hide this kennel behind the garden shed. Bright colours add to its appeal. The YOLO Large Dog Kennel is stackable, like yoghurt cups, for convenient transport of multiple units. Stacked five high on the back of a Mazda BT-50 bakkie.